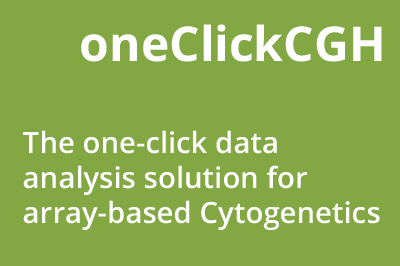 oneClickCGH is our novel DNA Copy Number software package designed to facilitate array-based chromosomal analysis for Cytogenetics. It provides diagnosticians with fully automated data analysis, visualization and reporting capabilities necessary to process data from a routine Cytogenetic test. It is fully compatible with all commercial array CGH and SNP platforms. Its major advantages are compatibility with output of any major array platform, simplicity of workflow design, unprecedented interactivity of the interface and comprehensiveness of its reporting features. This is basically an end-to-end solution for array data interpretation in a clinical setting. 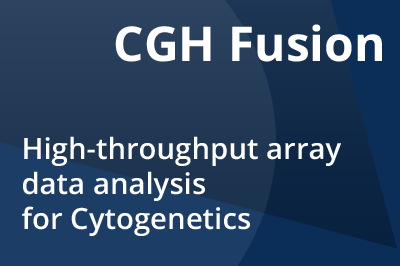 CGH Fusion is our state-of-the-art aCGH software built with high-throughput chromosomal analysis in mind. It is the perfect tool for centralized processing of high volumes of array data produced by Cytogenetic tests. In-depth analytics and rich annotation facilities of CGH Fusion are designed to dramatically improve efficiency of DNA Copy Number analysis in a clinical lab. CGH Fusion can enhance Cytogenetic workflow by comparing data from different samples, for instance, originated from the same family. This software is compatible with all major array CGH and SNP technologies, which gives you the power of being able to compare results across different array platforms. cnTrack provides a secure and scalable way to store, retrieve and manage aCGH and SNP array data for Cytogenetics laboratories. But don't think of it as just a data repository - cnTrack can also help you organize laboratory-wide operations for analysis of array data in the most efficient manner. You can work across all major aCGH and SNP array platforms including Affymetrix,Agilent, Illumina, PerkinElmer, Roche-Nimblegen and custom arrays. State-of-the-art dataset analysis engine enables clinicians and researchers to construct, curate and visualize Copy Number Variant (CNV) profiles built on large sets of accumulated data and to re-use them in their routine array-based Cytogenetic tests. 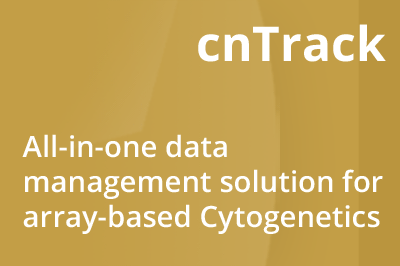 Seamless integration with infoQuant's Analysis Suite incorporating oneClickCGH and CGH Fusion makes cnTrack a powerful answer to everyday data management and interpretation needs of a Cytogenetics laboratory. Genomius is infoQuant’s free-access genomic structural variation analysis portal. This web-based system is designed to facilitate simple DNA Copy Number and LOH analysis including cross-sample analytics. 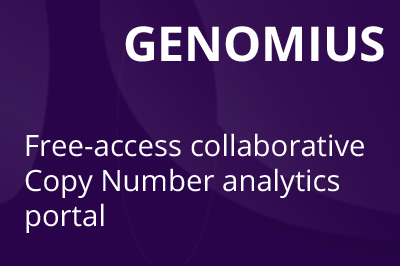 You can access Genomius using any browser, upload a set of anomaly region reports for a project and start browsing and analyzing your data in minutes. It was engineered with collaborative research in mind so your data, results, plots and notes can be shared with your colleagues with a click of a mouse button. Moreover, Genomius was designed with both Cytogenetics professionals and Cancer specialists in mind, so clinicians and researchers from both fields will find this free system useful for their daily work.